KATHMANDU, June 20: Nepal Oil Corporation (NOC) paid Rs 37.32 billion in different taxes to the government in the first 11 months of the current fiscal year. The petroleum monopolist different taxes, including Valued Added Tax (VAT), to the government while importing petrol, diesel, kerosene, aviation turbine fuel (ATF) and liquefied petroleum gas (LPG). Nagendra Jha, deputy executive director of NOC, said the corporation paid Rs 36 billion under different tax headings to the government in the first 11 months of the current fiscal year. NOC paid Rs 8.71 billion to the government as customs tax, Rs 3.37 billion as road maintenance tax, Rs 70.5 million as pollution tax and Rs 13 billion as VAT. Similarly, NOC has also collected Rs 8.19 billion from infrastructure tax levied on consumers. The petroleum monopolist has been levying additional charge on consumers to raise funds for construction of Budhigandaki Hydroelectricity Project (1200 MW). The taxes that NOC pays directly go into the government's account. NOC has imported 332,000 kiloliters (KL) of petrol, 1.06 million KL of diesel, 15,916 KL of kerosene, 137,376 KL of ATF, and 255,421 tons of LPG till mid-May. 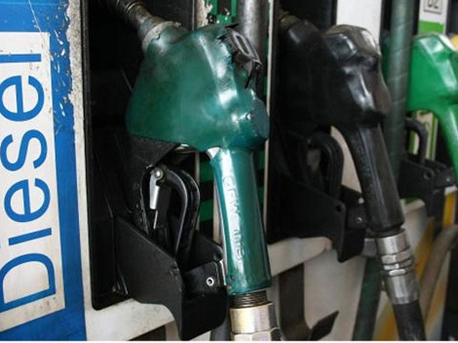 The government levies Rs 15.23 as custom tax on per liter of petrol, Rs 2.3 on per liter of diesel and kerosene each, Rs 2.13 per liter on ATF for domestic airlines, 3 paisa per liter on ATF for international airlines, and Rs 44.92 per cylinder on LPG. Likewise, it levies Rs 5 per liter each on petrol, diesel, ATF as infrastructure tax for the construction of Budhigandaki Hydroelectricity Project. Likewise, the government levies Rs 4 per liter of petrol and Rs 4 per liter of diesel as road maintenance tax. Similarly, it raises 50 per liter of petrol and diesel as pollution tax. After adding all the taxes and charges, the government levies additional 13 percent VAT on the total amount. NOC pays Rs 45.4 for a liter of petrol, Rs 44.5 for diesel, Rs 45.29 for kerosene, Rs 43 for ATF and Rs 832.35 per cylinder for LPG. Despite low procurement price, consumers are forced to pay more than 100 percent extra for petroleum products because of different taxes levied by the government. NOC sells petroleum products to consumers by adding administrative cost, technical loss, and infrastructure charge, among others. Adding all the charges, NOC sells petrol at Rs 100 per liter, diesel and kerosene at Rs 76 per liter, and LPG at Rs 1,375 per cylinder. The petroleum monopolist has always been blamed for selling petroleum products at higher price rates. However, NOC claims that the price of petroleum product is cheaper in Nepal compared to India. According to Sitaram Pokhrel, the spokesperson for NOC, petrol is Rs 19 per liter cheaper in Nepal compared to India. “Likewise, diesel is Rs 19.35 per liter. If we deduct the price further, it will trigger smuggling of petroleum products to India,” he added.